Harnessing wind energy in offshore environments. Similar to land-based wind technologies, offshore wind uses turbines to generate energy which is delivered to the shore via an export cable. A main advantage of offshore wind is the stronger and more consistent winds that blow offshore, allowing the use of larger turbine blades. The development of offshore wind in Europe and Asia has preceded development activities in other parts of the world. However, several projects in the United States are currently underway. While the most common offshore wind energy technology is a three-bladed horizontal axis turbine, there are a variety of foundation types which can support the deployment of devices in a range of aquatic environments – shallow nearshore habitats to deeper offshore environments. Monopile foundations are used at shallow depths (0-30 m) and consist of a pile being driven to varying depths into the seabed (10-40 m) depending on the soil conditions. 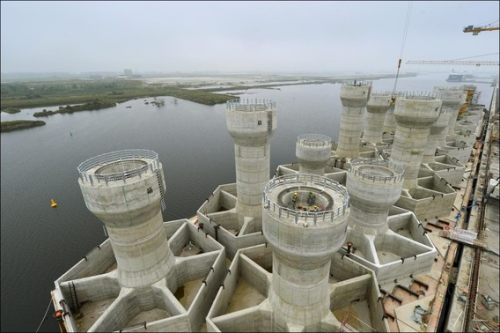 The pile-driving construction process is an environmental concern as the noise produced is incredibly loud and propagates far in the water, even after mitigation strategies such as bubble shields, slow start, and acoustic cladding are employed. As with land-based wind energy, collision risk with birds and bats is a major concern, though the impact is more difficult to quantify because carcasses that provide evidence of collisions become lost at sea. While the footprint of offshore wind energy is relatively small, it may still cause scouring. As with all electricity generation, there is a slight concern that electromagnetic fields generated by power cables may affect animals that use Earth's natural magnetic field for orientation, navigation, and hunting. Likewise, chemicals such as anti-corrosion paint and small amounts of oil and grease may enter the waterbody during spills, though some turbine designs do not require lubrication. Artificial reefing is likely to occur around wind farms as the new hard substrate provides protection and attracts colonizing invertebrates. 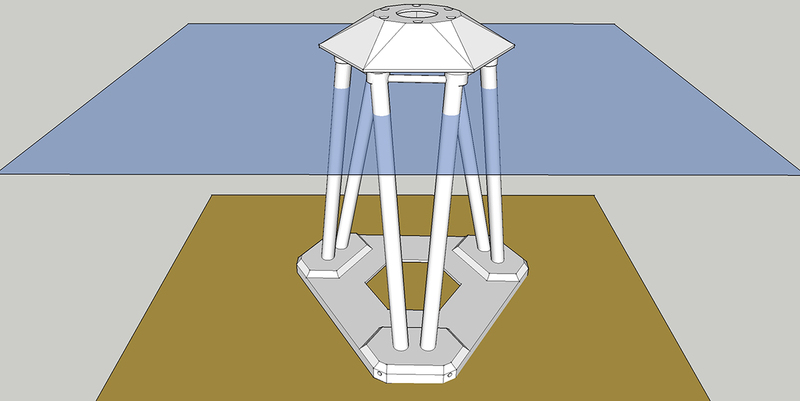 Tripod fixed bottom foundations are used at transitional depth (20-80 m) and consist of three legs connecting to a central shaft that supports the turbine base. Each leg has a pile driven into the seabed creating a wide foundation that allows for the piles to be placed at a shallower depth in the seabed. The environmental effects are very similar to monopiles, except that the footprint is a little larger. Gravity foundations are used at shallow depths (0-30 m) and consist of a large and heavy base constructed of steel or concrete to rest on the seabed. The footprint is relatively large and may cause scouring, artificial reefing, or physical destruction of habitats upon introduction. Otherwise, the environmental effects are similar to monopiles. 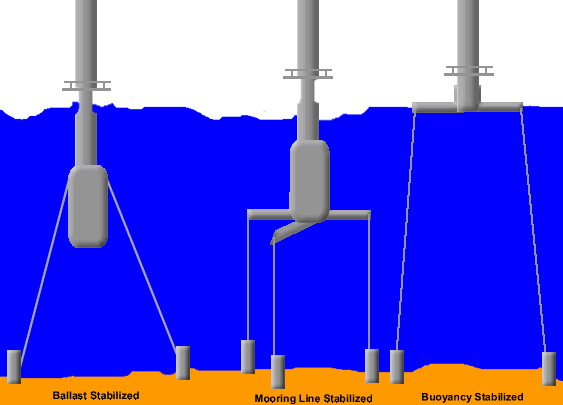 Gravity tripod foundations are used at transitional depths (10-40 m) and consist of two heavy concrete structures connected by three legs where one structure sits on the seabed while the other sits above the water. 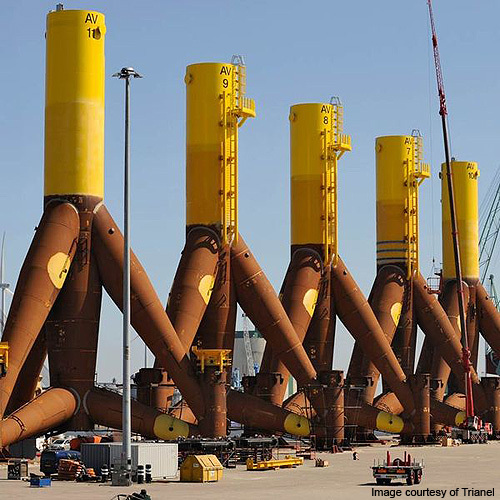 Very few offshore windfarms are currently using this foundation. The environmental concerns are identical to those of gravity foundations, though the scouring effect may be less significant depending on the design. Floating structure foundations are used at deep depths (40-900 m) and consist of a balanced floating structure moored to the seabed with fixed cables. The floating structure may be stabilized using buoyancy, mooring lines, or a ballast. 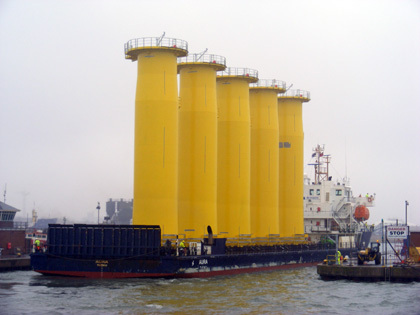 The mooring lines may cause minor scouring or pose a risk of collision, but the turbine foundation is mostly located in the upper layer of the water column where there tend to be less organisms. Humans should probably not not check this box that doesn't show for them.